Okay. So there are really more than five good reasons, but for the purpose of this post we want to focus on the top five. But first, why a MINI dumpster in the first place? While a dumpster rental may seem like a good idea for your major clean up or home remodeling project, for example, a full-sized commercial dumpster presents a number of problems for the typical homeowner. They tend to be unsightly and huge. No one wants a massive steel container taking up half their residential street or blocking an entire driveway. And your neighbors really don't want to be looking a that either. In addition, they are often difficult to get material into and require some climbing or handling junk overhead. This can be hard work and even a bit hazardous for many people. And if you have the company haul and load the dumpster for you it can be even more costly. 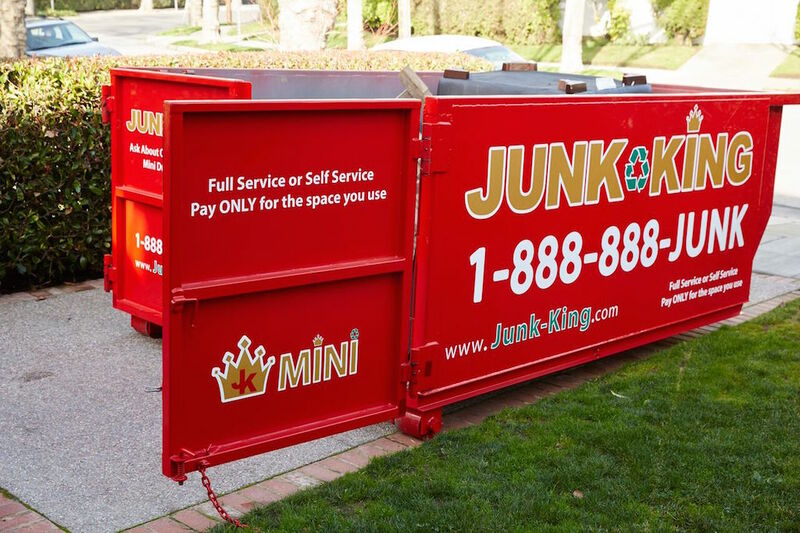 With a company like Junk King you have two efficient, safe and eco-friendly alternatives: On-site junk removal and renting mini-dumpster boxes. The goal is to simply make the whole process easy for you. If you want to benefit from the efficiency and convenience of on-site junk hauling and removal, we make it simple to book a one-time appointment or series of appointments for the duration of your job. In this scenario, our team will come to your home or place of business, remove your junk or trash, load it into our truck, and dispose of it in a safe, eco-friendly manner. This option means there will be no hulking dumpster sitting in front of your house for your neighbors to glare at or throw their own junk into during the night. In addition, this option means you won't be hauling stuff to the dumpster and struggling to get it in. And no extra fees for labor. But maybe you prefer to have a dumpster. We have made this easy for you, too. Junk King also offers mini-dumpster drop-off service. If you are a small business or a homeowner, you can rent and load these revolutionary MINI dumpster containers. Each MINI dumpster is equipped with special polycarbonate wheels which means these driveway-friendly boxes can be placed on your site without causing damage to your driveway or property. In addition, these rental boxes are versatile and easy to use. They are a great self-service dumpster for work projects, home renovations and other types of large cleanups. Their smaller size - just 12 cubic yards - means you are working with a dumpster that is compact, affordable and easy to use. Yet they still have an impressive load capacity. 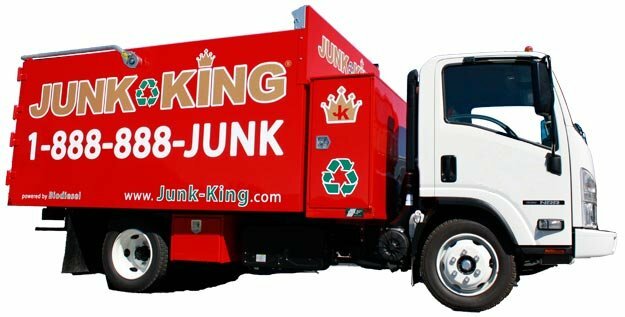 Our dumpster service features an online booking system and Junk King will drop off the dumpster and arrange for it to be picked-up once it's filled. An added benefit of using Junk King is that your materials will be sorted so the items can be reused, repurposed and recycled. Part of our mission is recycling and redirecting as much of your material away from landfills as possible. In addition, our services are insured to make certain nothing is lost or damaged. And, i terms of pricing, you only pay for the space used in the dumpster when you are done. Whether you are reconstructing a home or preparing for a move, we provide our customers with the tools they need to clear away unwanted clutter. With a warm and friendly crew that will do the heavy lifting for you, or a fleet of MINI dumpsters that let you to do it yourself, we have a solution for you. If you want, our professional and insured trash removal team will show up at your home or office and we will call 15 minutes before we arrive on site. Once we arrive we’ll give you a free estimate based on how much room your items take up in our truck.